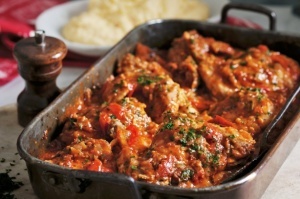 Infused with bold Tuscan flavours, this rustic dish would make a fitting centrepiece for a family feast. Dust rabbit in flour, shaking off excess. Heat 2 tablespoons oil in a frypan over medium heat and cook rabbit, in batches, for 2 minutes each side or until golden. Place in a baking dish. Heat remaining 1 tablespoon oil and cook fennel, onion, pancetta and garlic, stirring, for 3-4 minutes until soft and golden. Add wine and half the vinegar, and simmer for 3-4 minutes until reduced by half. Add tomatoes and rosemary, season and bring to the boil. Pour over rabbit, cover and cook for 1 1/4 hours or until rabbit is tender. Stir in remaining 2 tablespoons vinegar and scatter with parsley. Serve with polenta. Order rabbit from butchers and ask them to joint it for you. Flat pancetta and canned cherry tomatoes are from delis.